Later we stopped at a second waterfall, Krong Kma on our way to Lak Lake. 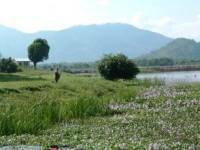 The lake is a peaceful & charming, resting beyond the Jun Village, without any commercialisation. 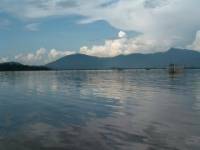 The boat ride on the lake is by the long thin dug-out canoes used by the local people. We were given a life jacket to wear before climbing into the boat as the lake is quite deep. A local young man rowed us out onto the peaceful water. A group of naked young children were splashing about happily at the waters edge. The only sound we could hear was the oars entering and leaving the water. No one spoke & no one wanted to break the silence. Large birds took off from amongst the water plants, there were dragonflies following us ding and swooping across the boat. A few fishing boats were waiting patiently to net their fish. It was a most pleasurable & memorable boat ride in this setting of natural beauty. Afterwards, a cold drink in the village shop sitting among the local people was very welcome. Cham showed us around the village of the Mnong community with it's famous longhouses. That night we stayed in a longhouse near the lake. 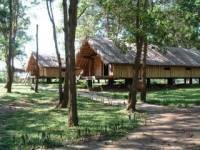 The accommodation consists of communal longhouses where we stayed, but there are also individual rooms in a low building by the lakeside. The longhouse is built on stilts, a wooden ladder climbing up to the platform. There were plastic slippers provided by the door to wear inside the hut. Once inside a long room was provided with comfortable mattresses on the wooden floor with mosquito nets. We were all going to sleep alongside each other just like the local people. The toilet facilities were outside in a separate block. These arrangements are admittedly quite basic, but for those who don't want to 'rough-it' there are individual rooms with en-suite bathroom facilities built in for hire. My advice is to take your shower before dark then you will miss invasion of flying ants attracted by the lights. The insects were only noticable as the rainy season had begun, normally there is no problem. As dark falls the only entertainment is to gather round in the little waterside bar/restaurant. The open wooden deck is actually a floating platform a thatched roof. A tiny counter serves drinks & a small kitchen will serve some simple dishes. The sound of insects filled the air. Crickets were flying around and being eaten by the dog! I drank my Saigon beer & swallowed my deep fried fish under the flying insects. I climbed back to the longhouse & went to sleep on the mosquito-net covered mattress fully clothed at 9 o'clock. I was woken many times during the night by the sound of the geckos close by. It was a long rather restless night. The sound of the birds woke me at dawn. As I sat down at the same waterside restaurant for breakfast I came to appreciate the beauty of this place. The lake is so beautiful in the rising sun. The water lilies are shinning on the calm water, the hills are beginning to emerge from the background mists. Suddenly the insects of the previous night seemed a long time ago. 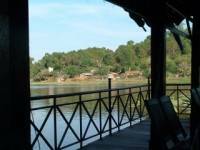 We drove back to Buon Ma Thuot to check in at the best hotel in town, the Thang Loi hotel. As this is not an area well developed for tourism, deluxe hotels are non-existent, but the government-run hotel is nevertheless comfortable and spotlessly clean. Lunch at the Quan Ngon restaurant in town today was the best food I had had in this region. The sauté 'Pergularia Minor' with Mushrooms & the dry boiled eel were outstandingly good. The rest of the programme today was a visit to the museum of ethnology & the Ede tribal village in Ako Dhong followed by an elephant ride in Don village after lunch. The elephant ride was the high point of the day. We sat on the little wooden 'howdah' on top of a huge 60-year old elephant. The 'mahout' was a little skinny old man perched on the neck of the elephant, using his feet to stroke and kick the elephant's ears depending which way he wanted the animal to go. We rode through rivers & the dense jungle. The most amazing part was crossing the river. The deep water was rising to just below the elephant's head in some places. The elephant's trunk was busy testing under the water to feel the way forward. It was exciting as well as a bit frightening but I was told that the elephants never make a mistake. Next day we transferred to Kodong for an afternoon trekking through four villages. 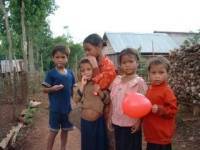 Before we sat off Cham recommended we buy some candy &balloons in the market to give to the village children. The minority people are very poor, and a little candy or a balloon is enough to make the children very happy. I brought four bags of balloons & candy, and gave it all away, bringing a happy face to all the children. I wondered whether the children in our world would be happy with just a balloon or a sweet? A sudden tropical rainstorm caught us out, soaking us from head to toe. The highlands are known for wetness but the rain came down like a waterfall, turning the paths to muddy rivers. That night we stayed in another longhouse in Decop village drinking rice wine. Because of the heavy rain the traditional Bahmar Gong dance had been cancelled, so the old caretaker of the longhouse &his son joined us for the rice wine drinking and story telling. It was a good evening, pure local culture &very entertaining. 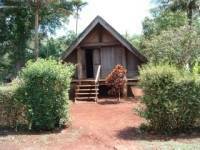 Driving up towards Kontum to visiting Dakro & Pleiku city, we checked in for our overnight stay at the Pleiko hotel, another government run establishment that is clean & comfortable with very spacious rooms. The following day we flew back to HCM & checked in at the Asian hotel. We found this 2-3 star hotel exceptionally good for its class, the room, the décor, the reception & the breakfast in the restaurant were excellent. The hotel is also perfectly located in the in the main tourist area of HCM with a new grand department store just opened next door. We spent the day in HCM, moving to the Oscar Hotel for the night.